This week, you will hear about an anti-Nazi picnic in Avalon, PA, some brief analysis about the Nazi mob in Chemnitz, Germany and about some folks pushing back against the Pope’s visit in Ireland]. We interview Michael Loadenthal, a social movement academic and former J20 defendant, about the riotization of protest and new strategies the state is using to criminalize dissent. We also continue to highlight the ways police and fascists are aligned. We give an extensive update about what we know so far about the 2018 Prison Strike and we interview two supporters who are championing the strike inside the Northwest Detention Center in Tacoma, Washington. Finally, we wrap up the show with political prisoner birthdays and next week’s news. But, right before that-the Rebel Girl and the Riot Dog sing a duet, so seriously-listen until the end!!! Send us news, events, or ideas on how our show can better serve anarchist activity in your town by emailing us at podcast@crimethinc.com. The 2018 #PrisonStrike is ongoing! 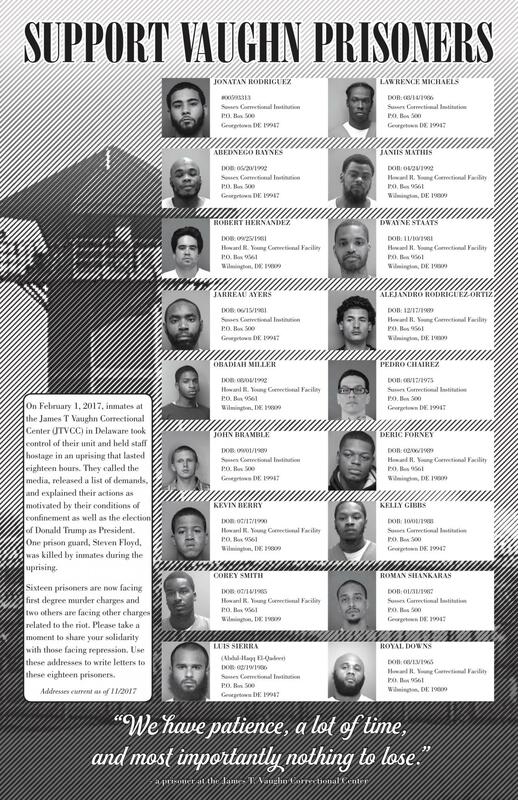 Check out the Incarcerated Workers website for more information, resources, and the list of prisoner’s demands. Also, episode #50 of The Ex-Worker is all about the 2016 national #PrisonStrike. Watch furry minks being liberated here! Check out our essay on Taking a Global View of Repression, exploring how states develop and share repressive strategies, and how anarchists can counter them. Now That’s What I Call Kerkhophony Volume 1, the album dedicated to Jennifer Kerkhoff (the rotten scum of a prosecutor who was responsible for the J20 trials), is available here. And get your burning limo t-shirts while supplies last here. To support water protectors who’ve been arrested in the fight against the Bayou Bride Pipeline, you can donate to L’Eau Est La Vie at gofundme.com/nobbp. Check out this poster to learn a little more about the Vaugh Prison rebellion and to get the addresses of those being repressed in the aftermath. Use this straightforward guide to writing prisoners from New York City Anarchist Black Cross to write Ronald Reed and John Bramble.